The letter doesn't need to say anything in particular, it simply helps to prove that you live where you say you do, and a government department knows where you live too. Note 1: The sponsor should provide evidence that he/she lives at the address given above. This evidence should include one or more documents from the list below. Please note that applicants must also provide evidence of their sponsor's ability to maintain and accommodate them without recourse to public funds. The letter satisfies the first part, "evidence that he/she lives at the address given above". That section of the form is an instruction for the sponsor to provide evidence that they live at the address stated in the form. ‘Letter from any government department’ would include eg any correspondence to the sponsor from HMRC, Dept of Work & Pensions, the Home Office etc. at the address stated in the form. The actual content of the letter is irrelevant. It’s probably worth noting that having a sponsor does not mitigate a visa applicant from needing to qualify in their own right. 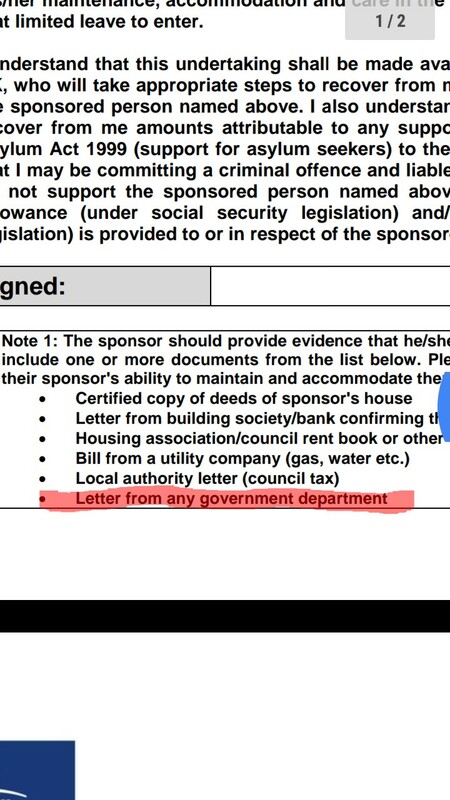 The sponsor undertaking form is not mentioned in the Supporting documents guide https://assets.publishing.service.gov.uk/government/uploads/system/uploads/attachment_data/file/549692/Visitor_Supporting_Documents_Guide_-_English_version.pdf. This answer explains when UKVI might ask for a sponsor undertaking in connection with a Visitor visa application UK visa refusal on V 4.2 a + c (and sometimes 'e'). Not the answer you're looking for? Browse other questions tagged visas uk paperwork standard-visitor-visas or ask your own question. When is SU07 form applicable for standard UK visit visa?